What do others say about their experience? 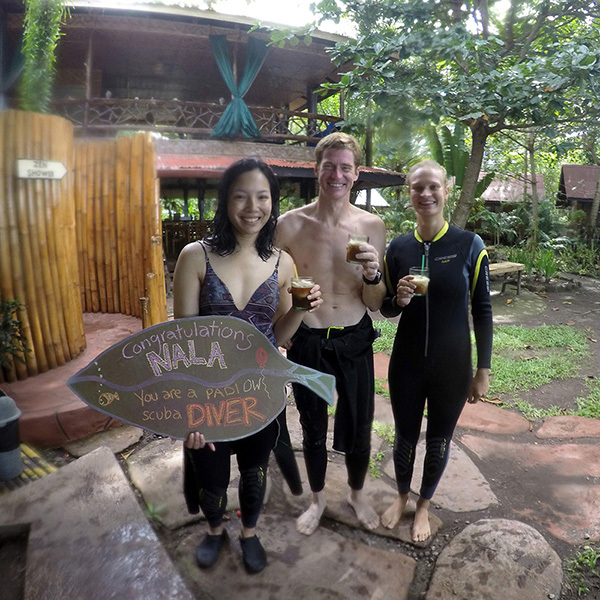 My yoga/diving retreat – which I extended from five nights to ten while I was there – was everything I hoped it would be and more! The pace of each day was perfect. 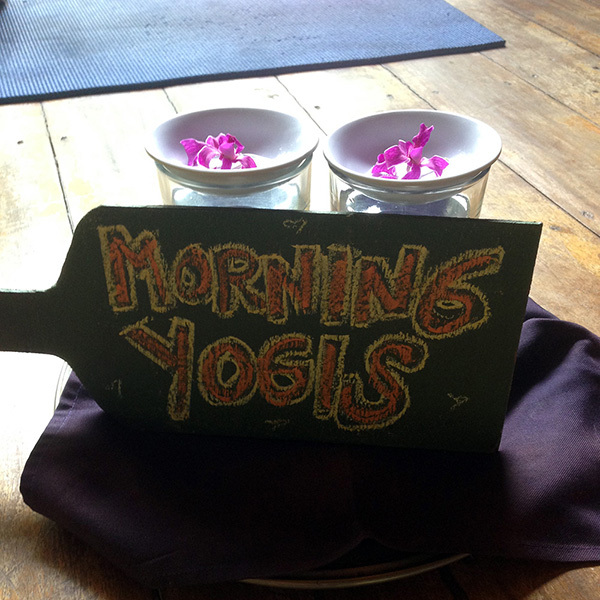 (Optional) early morning yoga, amazing breakfast (the food is so good! ), out on the boat for a dive or two, more delicious food for lunch, a lazy afternoon in a shady hammock or on the beach (or out and about for a bit of island exploration), some more yoga (if you feel like doing the sunset session as well), then dinner in the open air restaurant just meters from the beach (I often ordered the grilled fish which they get fresh from the market for you the same day – so good!). The well-kept beach bungalows are delightful, and the mood of the place is easy and relaxed, but where Kaisa and Arno really stand out is in the exceptional care and attention given to every last detail of your stay – which combines to make it a really perfect experience. 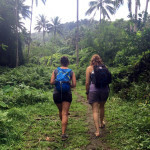 They will also happily give tips for loads of other things to do and places to go around the island. 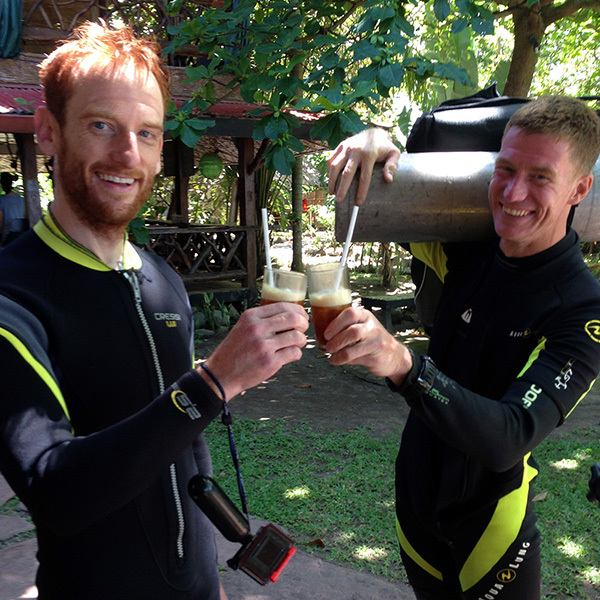 Dive instructor Arno is an excellent (and patient!) teacher, and his passion for diving is absolutely infectious. And the in-house yoga teacher when I was there (they host a different traveling teacher every month or two) tailored the classes brilliantly to my/our needs, and I gained so much knowledge and inspiration from her. I feel really fortunate to have had such individual attention from two really talented and dedicated teachers. Thanks, Kaisa and Arno and all of your amazing and happy staff, for making me so welcome and for looking after me so well. I definitely hope to be back some day! Very nice place to stay with good food and comfortable accomodation. We stayed almost all the time in the complex area and never got bored. The atmosfere is very relaxing and the yoga classes were great. 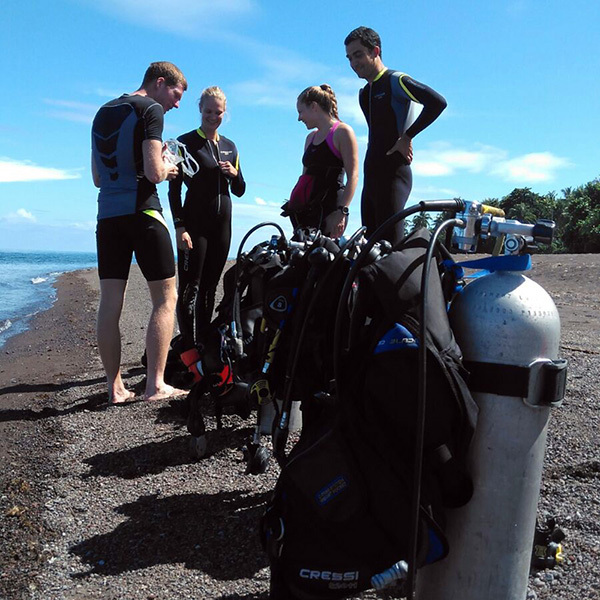 Special mention to the diving course, it was an amazing experience (thanks again, Arno). My retreat with Kaisa and Arno at Reconnect Discover was perfect for my needs. I was picked up from my other hotel on time and brought to their hotel and greeted warmly before given my schedule for the week. 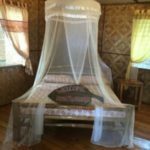 I stayed in a beautiful bungalow overlooking the beach. It was simple, stylish and super comfortable with a nice big bed from which you could also see the water and hear the waves. 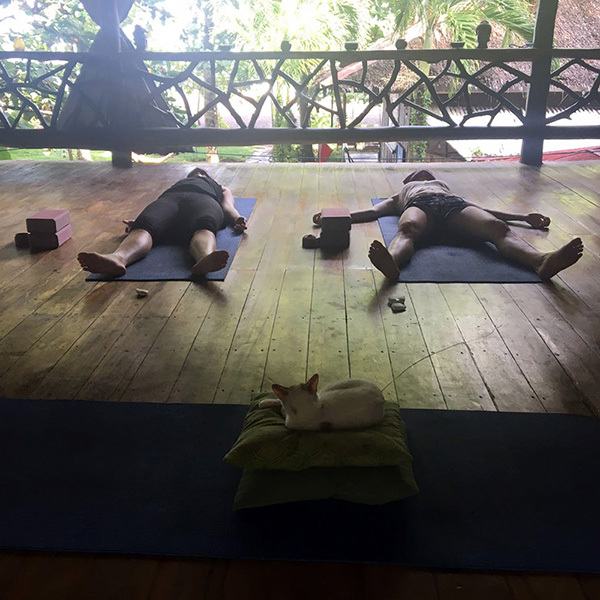 Yoga classes began in the morning for 1 1/2 hours and ended in the evenings with another round of 1 1/2 hours with a highly trained yoga teacher. 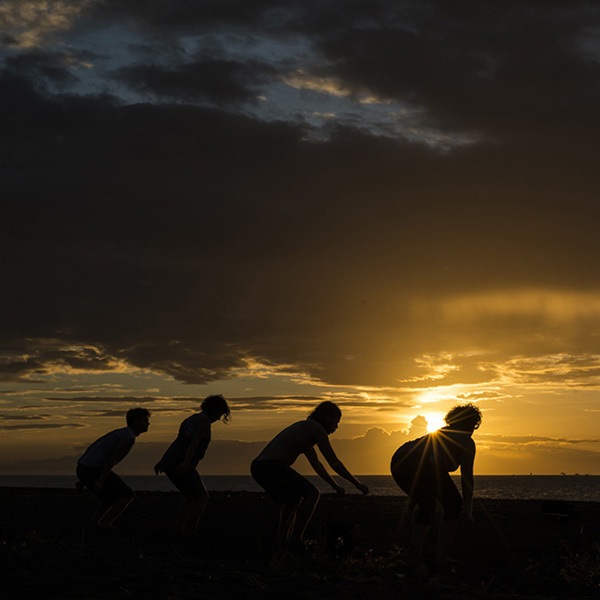 On one occasion, we went to White Island for sunset yoga and it was for sure a highlight of the week. Luckily, Kaisa and Arno provide a menu with juices and plenty of healthy choices to the average fare seen in most restaurants. I would highly recommend a retreat here as the couple very much complement each other. 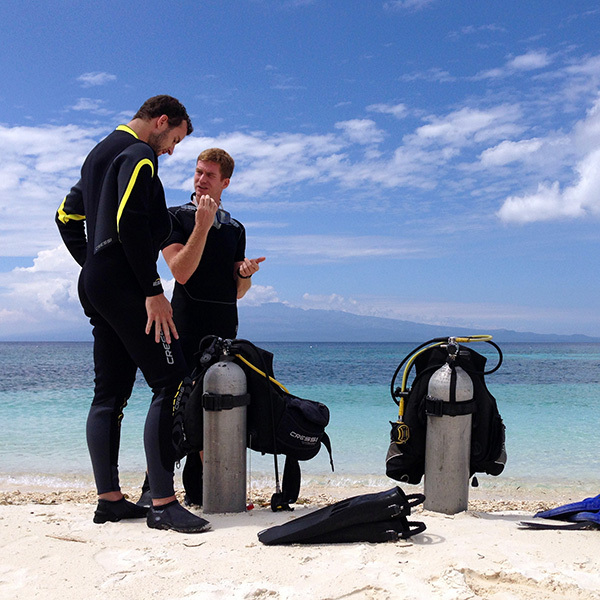 I did not take advantage of the diving with Arno but would do so next time as he is a passionate diver and fine teacher. All in all, I would definitely go back again and advise anyone traveling together or alone, to take advantage of this gem of an opportunity. I arrived at the yoga retreat and messaged all my friends to say I’d died and gone to heaven! I left Camiguin Island feeling relaxed and alive, yet sad to be going home. 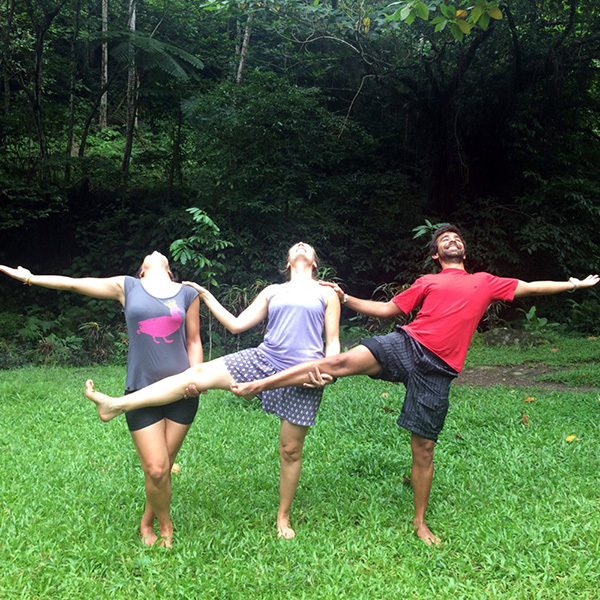 My yoga and scuba retreat was everything I’d hoped it would be and more. Kaisa is a great host and it feels like you’re being welcomed into her home, not just her business. The accommodation is well equipped and spotlessly clean. It is situated on the beach and there are hammocks and sun loungers scattered around for guests to relax on. The restaurant serves the best food I’ve eaten in the Philippines, with a wide variety, all freshly made. 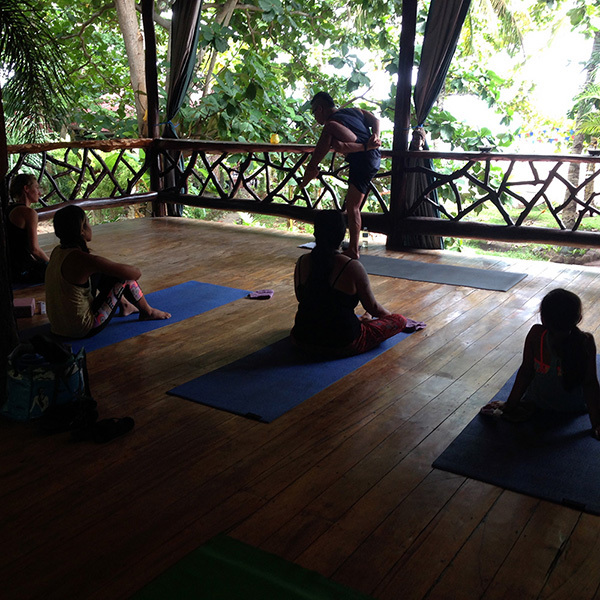 The yoga area is perfectly positioned to watch the sunset and hear the waves, as you practice. 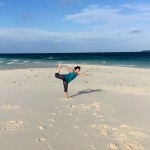 One day we took a boat out to a nearby sand bar called White Island, and had the opportunity to swim/snorkel before a yoga session – on the white sand, as the sun was setting. It was magical. 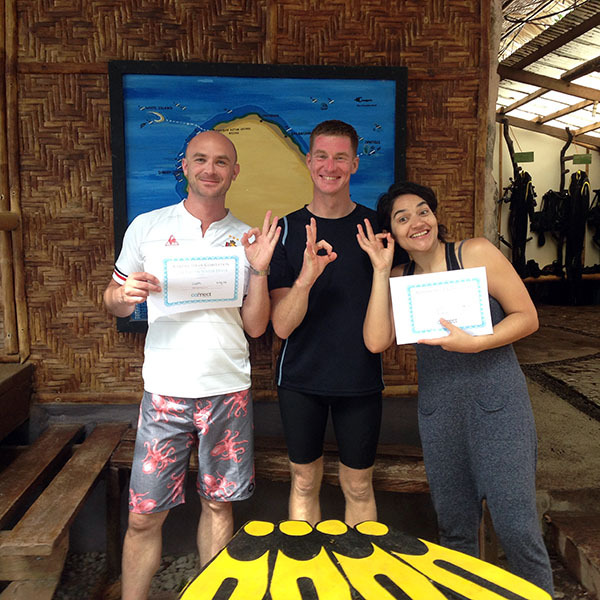 Kaisa’s partner Arno runs the scuba diving side of the business and whilst I was there I gained my PADI Open Water certificate. Arno is a great instructor, he and his staff are very professional. I’m so grateful to Kaisa and Arno. They are very approachable with any questions you have, and respond quickly with good advice so you can tailor make your experience to get out of it what your mind/body needs. 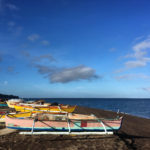 We have just returned from our wonderful stay at reconnect discover in the beautiful island of Camiguin, Philippines. I would like to sincerely thank the guys at the resort for helping us enjoy this lovely stay. The staff were really friendly and very helpful. Everything was so relaxed and nothing seemed to be too much trouble. I couldn’t recommend this place highly enough. 11 out of 10! Hopefully see you again soon. 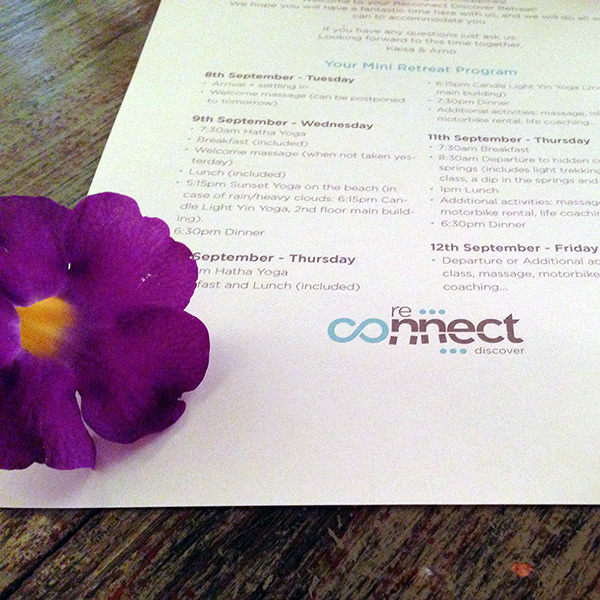 I had a wonderful stay when I had my Yoga Retreat with Reconnect Discover. The facilities were wonderful, the food was great, and the place was very quiet and relaxing. The hosts — Kaisa and Arno — were very gracious and kind, offering help in every aspect of my trip, making sure that I had the most wonderful time during my stay. Moreover, they arranged for all my transportation needs as I went around the island of Camiguin. 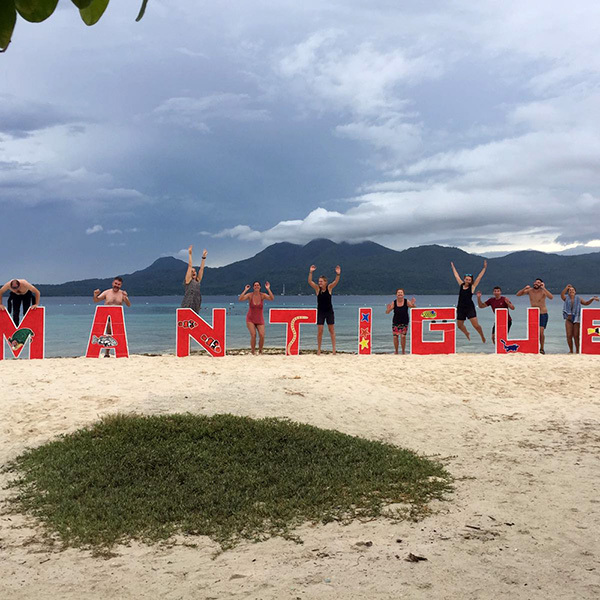 Lastly, Camiguin is the perfect place to go on a solo yoga retreat because not only are the teachers very good and accommodating, but the island offers a whole lot of activities that one can enjoy in between classes. 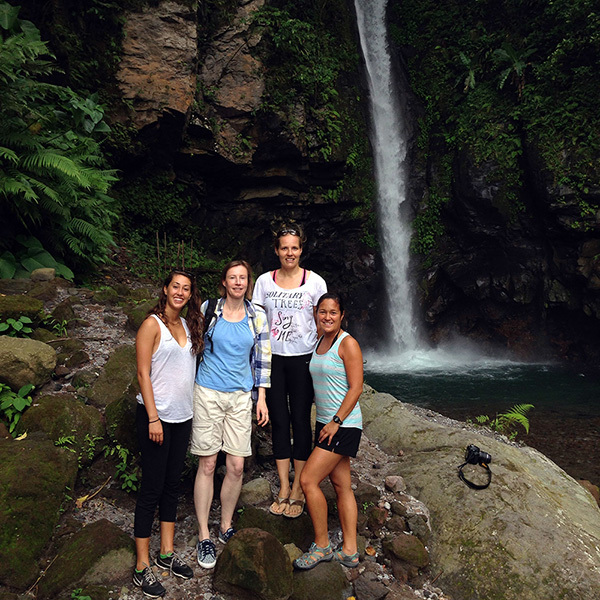 I had a wonderful stay on Camiguin Island. 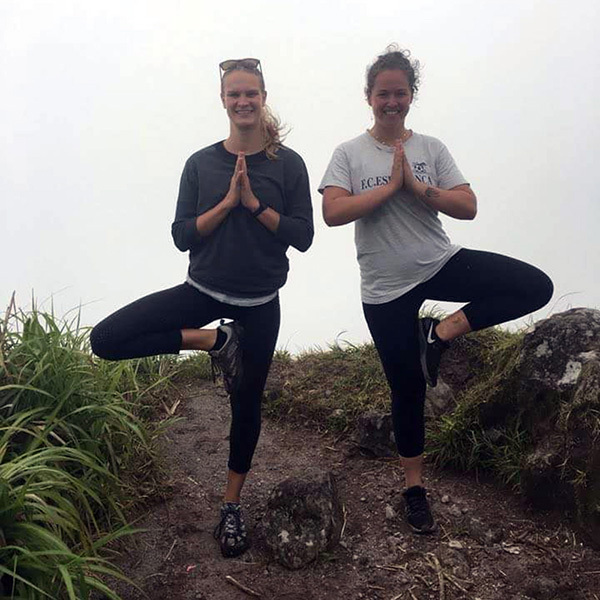 I was new to yoga and was introduced to different types of yoga during the retreat. Once it was held on the beach, another time at a nearby cold springs. 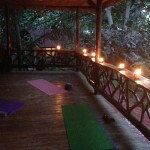 Yin yoga was a beautiful experience and my favorite in candlelit nature. Being so close to the calm sound of the ocean with almost nothing but the nature, I realized that this was the first time in years that I focused utterly and totally on myself, and I loved it. The new friendships made during the week will also remain special. We have shared some great conversations and laughs from all our countries!!! Yoga with Reconnect Discover was an awesome unique experience. Breathtaking in the way it makes you feel. Inspiring because of the view you have towards the beach. And amazing how yoga combined with the sounds of the ocean and nature can calm you down, focusing only to yourself. The teacher had a loving, caring and professional touch to yoga and in her classes you will learn not only how to yoga but learn something from yourself. 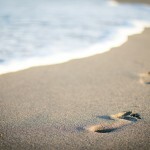 Choose the best Retreat package for you, and let us welcome you to our island paradise! © All Rights Reserved by Reconnect Discover unless differently stated for all content in this domain. Nothing may be used without Reconnect Discover's express permission.